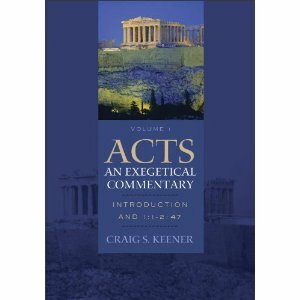 Craig Keener’s first volume on the book of Acts covers two chapters while containing decades’ worth of extensive research. To dismiss the weight of this volume is to forego a severely missing component in any study on the Acts of the Apostles. I have a certain trepidation in approaching such a large volume for review. Indeed, this book is well worth a year of study and another for reflection and measurement of use before a thorough-going review can be given. After all, where do you start? Perhaps on the back cover, with the endorsements. This, after all, are where many of us will start when judging a book. Endorsements run the gambit of modern scholars, from ]] to ]]. Dunn calls it a “first off the shelf” book while Bottini calls it a “monumental exegetical commentary.” Others call attention to the massive amount of information germane to the discussion, often missing in other commentaries. We could start there; however, we would need to quickly move to the inside now — now that your questions as to whether or not this is a critical engaging commentary has been appeased. There are two parts to this volume, the introduction and the commentary. The introduction is a massive tome, some six-hundred pages, covering nearly every facet of a study of Acts. Keener is not lax when it comes to answering the student’s questions, even preemptively. He even provides for the limitation of this massive volume by giving an answer for them first and thereby creating a paradox! The author explores literary sources, historical reliability, ancient approaches as well as details some objections to the commentary including the genre and use of labels. He does this just in the prolegomenon of this introduction. Keener spends the next three hundred pages covering Acts as historiography including reaching into the dating of Acts while he explores all sides of the issue. Perhaps that is the greatest strength of any of Keener’s works — they are far from polemical, far from one-sided. This is a small enough section, I believe, to explore as part of this review. In chapter ten, Keener examines the dating of Acts. Currently, Acts is held by most scholars as having been written rather late, with come scholars pushing it into the second century. He briefly rehashes why the authorship of Acts, the author is Luke, is important. Keener sites Xenophon and his histories as works written long after the fact, but by those who had experienced them. He then feels comfortable suggesting that he holds to a centrist position, that of the 70s-8os, the majority view. Yes, he states his position, however for our sakes, Keener delves into the other dating schemas, exploring their weaker points including the premature ending. He even goes so far as to cite the stronger points for the earlier date, such as Richard Longnecker. His only issue here, and it really pertains to the Markan scholar, is his acceptance of an early dating of Mark. In exploring the late date, Keener uses the continuation with Judaism found in Luke-Acts against the idea that Acts hails from the second century. I find his methodology here convincing even I do not agree with him completely on the dating. The introduction has two excursuses. The first deals with physicians in the ancient world while the second examines the “Background for Luke’s View of the Spirit.” The commentary portion, however, has numerous excursuses discussing a wide variety of topics including Zealots (744), Dreams and Visions (911), and Messiahship (964). Like the rest of the volume, they are expanded past the normative models. Messiahship covers six pages, filled with numerous footnotes. This particular excursus examines the role of Messiah from David through the Bar Kokhba revolt. There is little here that can be classified as pure theological (Christological) with Keener instead relying on something more than “the Bible/Church says” approach to reading Scripture. Kenner separates this verse into several topics, including repentance, baptism as an act, baptism in the name of Jesus, and the gift of the Spirit. One can now see how we can spend so much time on one verse. The Hellenistic-Jewish background is given on repentance as well as discussion of literary sources from Qumran and other Second Temple sects. The original word’s meaning is sought after not just in these literary sources, but so too in canonical books. Baptism is given the same treatment, but interrupted by an excurses meant to serve as history of the theology of these verse. Under the heading of “Baptism in Jesus’s Name,” Keener brings to light the connectivity of Acts 2.38 and Matthew 28.19, although what is lacking is the usual Oneness-Pentecostal interpretation. Indeed, what is lacking is a theological interpretation altogether, but instead, present with us is the historical assessment of the verse. He finishes the commentary portion with an examination of what Luke believed was the gift of the Spirit. In all of this, Keener does not break character and insert Christian doctrine or dogma into there. There are no theological applications nor theological exegesis. The commentary instead gets to the author of Acts, of this particular verse, by using all of humanities available to Keener. Whether it is the Greek or the higher criticisms, Keener relies on studied science to help him navigate the reader to a place where they can draw their own conclusion. The sources Keener draws from are numerous. His list of abbreviations fill over thirty pages, ranging from the Dead Sea Scrolls to Nag Hammadi. The Rabbis are consulted as well as the Church Fathers. Demosthenes and Euripedies, Fronto and Isocrates. The Romans, Greeks, and Hebrews provide voices for Keener’s chorus. Added to this are the nearly 10,000 footnotes and citations between the covers and the nearly four hundred pages of works cited and indexes included with a separate cd, one cannot easily dismiss either the work nor the conclusions Keener has poured into this volume. I suspect, that by the end of the series on Acts, Keener will have left us his magnum opus and it will survive for a lot longer than other commentaries.